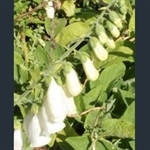 Foxgloves are well known and well loved, with their spires of distinctive tubular flowers. The common wild plant in Britain is Digitalis purpurea, whose flowers we used to place on all our fingers when we were children (whence the name Digitalis). Such things are frowned on nowadays, as all parts of the plants are toxic. This species is a biennial, but many are perennial, living in gardens for many years, and they come in a range of colours, some with amazing multicoloured flowers, not brilliant colours, but elegant and refined.